Our Dutch design.school offers training programs in Dutch design.thinking. Become a better version of yourself by developing your innovational & entrepreneurial mindset and competencies. The Dutch design.thinking mindset, process, tools and techniques empower you to collaboratively develop human-centred solutions to complex contemporary challenges. With traineeships, internships and innovation games our Dutch design.school offers a unique opportunity to kick-start your career as a professional and entrepreneurial Design Thinker. 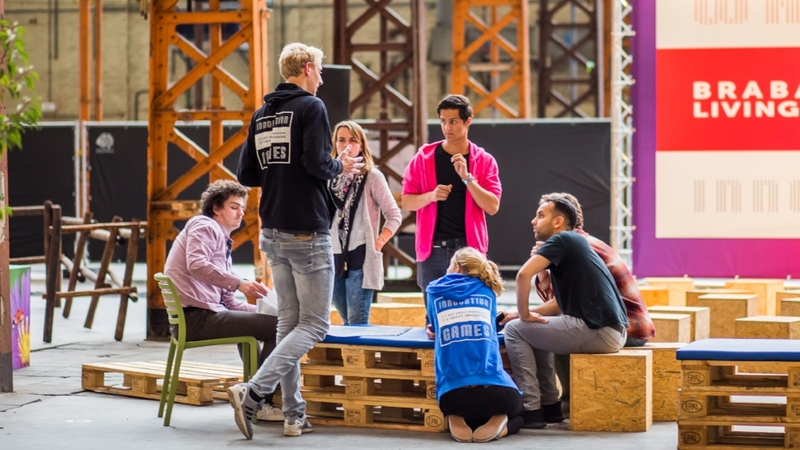 The Innovation Games is a one-week program (24/7) for young creative leaders to gain profound insights into the Dutch design.thinking innovation method & mindset and to work together with big organizations as project partners on real life challenges. Through exploration with sector experts, corporate leaders and major companies, 40 up to 100 young professionals, students and starters will identify needs, frictions and opportunities for real life challenges. With those insights they will develop innovative solutions that will be pitched for the Dragons Den jury during the final presentations. This way the Innovation Games is a social event that equips talents with a new mindset to drive innovation and change. Due to my experience with STUDIO.WHY I found out that my future is with innovation. I never learned so much in just five days and had such a great time! The Innovation Games are such an amazing concept, I wish everyone could have this experience! When I visited STUDIO.WHY for the first time I made a decision: this is what I want to do for the years to come! With this traineeship I really can make the difference for young people and the future of our province! I have learned to think like an entrepreneur! Why this is so important? Seeing opportunities is a must to create human-centric innovations. We believe that young minded people can evolve a positive change in society and make real impact together. We want to contribute to a movement that stands for new values. We help young professionals to develop their entrepreneurial skills and mindset to make this change happen. Through their community they organise events, workshops and challenges. Will you join us too?